– Continuous maintenance of operating equipment. Varnish refers to oil aging products that form deposits in the fluid system which have a gel/resin-like consistency or resemble solid varnish . These oil aging products are readily deposited on cool surfaces such as the tank, valve housings or coolers. This causes an increase in bearing temperatures, malfunctions in hydraulic valves and cooling problems. In most cases, however, the above malfunctions are not correctly attributed to the real cause. This results in ineffective, and often very expensive, repair work. The base oils generally used today for the production of turbine oils have changed in recent years. They reflect the increased demands with regard to higher turbine efficiency, higher bearing temperatures and reduced levels of hazardous substances. Whereas oils used to be produced exclusively by the distillation of crude oil (ASTM Group I oils), for some years now further refinement processes have been employed. There is a problem with this refinement in that varnish has a polar structure. Polar substances tend to dissolve more readily in polar substances. If the proportion of polar hydrocarbons in oil is reduced, oil aging products / varnish cannot dissolve as easily. The effect is oil turbidity or deposits in the system. These changes usually start once the oil has been in operation for 3 to 4 years. lead to sparking in the system . In addition to damaging the filter elements, it can cause failures in measurement and control systems. In addition, deflagrations may occur in return lines or in the tank. The MPC value records the changes in colour of a laboratory filter membrane with 0.45 μm filtration rating. Critical system conditions occur if the MPC value is over 40. The effect of this is that more deposits occur in the system, as shown in Figure 1 to Figure 4. The size, number, and composition of particles significantly impact the wear and the function of hydraulic components and systems. The size and the number of particles are determined using automatic photo-optical particle counters and is displayed as cleanliness classes to ISO 4406. The relevant standard for particle counting is ISO 11500. The standard maximum cleanliness classes for turbine lubrication systems are ISO 18/15/12 and ISO 17/14/13 if the steam control system is supplied by the same tank. In this case, an increase of one cleanliness class equates to a doubling of the particle count in each case. The solubility of oil aging products/varnish is dependent on temperature; it increases at higher temperatures and decreases at lower temperatures. As soon as the solubility threshold is reached, oil turbidity occurs. The particle counter is able to detect this turbidity due to the high particle count before it is visible to the naked eye. If two identical oil samples are analysed – one at room temperature (approx. 22 °C), and the other at 80 °C – there will be a difference in particle quantities in the evaluation if there is varnish in the oil. Antioxidants are added to the oil to slow down oil aging and hence the formation of varnish. These additives (e.g. amines and phenols) degrade as the oil ages. In order to increase the proportion of antioxidants, one of the usual options is to make up the oil quantity lost during operation with new oil. The addition of new oil, which still has 100 % antioxidants, will increase the overall concentration of antioxidants in the oil. In addition, partial replacement using new oil is possible. Although increasing the proportion of antioxidants, it may under certain circumstances have the effect of dislodging deposits in the system, thus adding to the particle concentration in the oil. For this reason with larger refill quantities, we recommend that the existing system filtration is supported by additional offline oil conditioning. 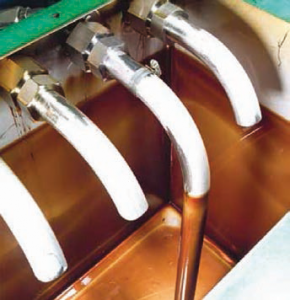 In order to clean the varnish in the oil, a Varnish Mitigation Unit (VMU) produced by HYDAC (Figure 6) can be used. This system is similar in construction to an offline filter and works 24h per day, 365 days per year. The separation of varnish takes place by adsorption onto a specific resin. Once the adsorption capacity of the resin is exhausted, the quantity of varnish in the oil rises again. When the critical MPC value of 40 is exceeded, the resin-filled elements are changed. The increase in the efficiency of turbines and the reduction of oil volumes (circulation indexes) increase the load on turbine oils. Modern turbine oils with higher chemical purity and low levels of hazardous substances reduce the solubility or load capacity for oil aging products. Where the filter load is too high or the filter selected is too fine, the extremely low conductivity of these modern oils can also lead to electrostatic discharges in oil. These discharges cause an extreme thermal fluid load due to hot spots. The result of this high thermal load is usually accelerated oil aging. In order to avoid critical system operation, the routine analysis parameters have to be broadened. By sizing & selecting the system filtration correctly, the electrostatic load in the fluid is eliminated and the fluid lifetime is extended. Fluid maintenance measures such as the separation of varnish, offline filtration, dewatering and degassing reduce the fluid load and thus extend the service life of the oil as well as the components. Simultaneously this contributes to the trouble-free operation of the overall system.